Shrimp tacos on a weekday just happened. Lighter, healthier, and tastier than ever before. 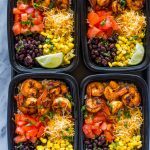 Meal prep is getting better and better ever week and I couldn’t think of a better lunch then these spicy flavorful shrimp taco bowls. These bowls are healthier and nutritionist inside out. Shrimp is considered one of the world’s healthiest foods! Aside from the protein, shrimp are packed with antioxidants, vitamin D, B3, and are also a great low-carb food that can help you lose weight and suppress your appetite. I like to use brown rice when meal-prepping. It give you a very steady dose of fiber and gives your body a steady controlled energy release to last you throughout the day. For the sides, I used black beans, corn, cheese and tomatoes. If you want to go the extra step, add chopped salad, sour-cream, salsa or guacamole after re-heating the shrimp. To assemble: Divide brown rice into 4 meal prep containers (1/2 cup each). 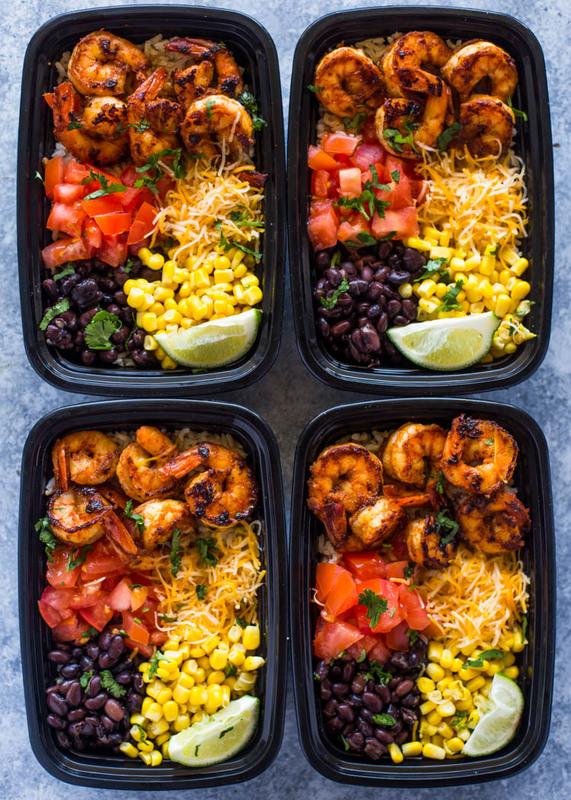 Top with 5 shrimps, a scoop of black beans, corn, tomatoes, a sprinkle of cheese, cilantro and a slice of lime. Cover and refrigerate for a max of 4 days. To serve: Heat bowls in the microwave for 2 minutes or until heated throughly. Drizzle with lime juice and top with salsa, sour-cream or gucamole if desired.